Previously a brick building with red Norfolk pantiles, the property looked run down, outdated and was badly insulated. Once the outside walls were insulated and rendered and new triple glazed aluminium windows were installed, Jon Barrell, the owner of the property, turned his attention to the roof. A total of 3,000 Westerland slates and 30 metres of Cembrit Slate Duopitch Ridge Ventilation were used to complete the re-roof, which was completed by Scott Sell Roofing. 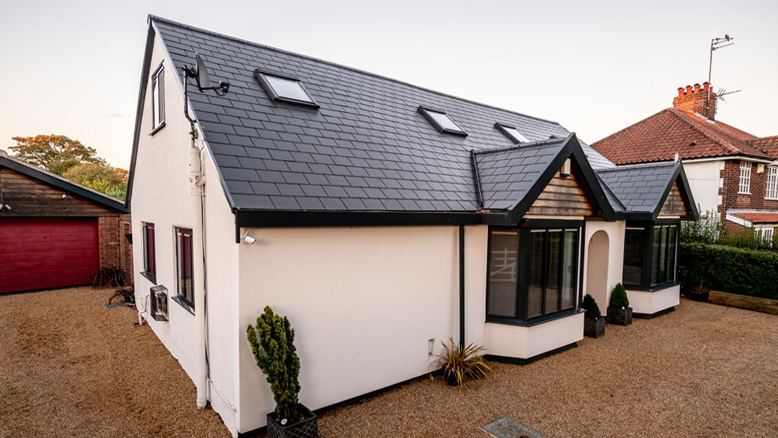 Jon didn’t want to introduce cement edges to the gables as a finishing detail, so opted for Cembrit PVC dry verges, which provided the perfect colour match to create a consistent finish across the roof. Following the project, Jon fed back to Cembrit that the roofing team enjoyed working with the Cembrit slates, as they found them easy to cut and fit. Cembrit’s Westerland slate has a surface texture and dressed edge similar to that of natural slate but does not need grading and sorting prior to installation. Finished with a semi-matt acrylic coloured coating to the top face and edges and a tinted high-performance binder to the back face, the finish is of the highest quality. Easy to work with, as no power tools are needed to re-size the slates, Cembrit’s fibre cement slates simplify the install period and act as an economic alternative to natural roofing materials. Westerland slates are manufactured in accordance with a quality assurance system to BS EN ISO 9001-2015 standard and to the requirements of BS EN 492: 2012 product specification for fibre cement slates and their fittings. Westerland slate has been awarded the BBA Certificate No. 03/4041. Cembrit’s fibre cement slates achieve the highest approvals from local national and international agencies in the fields of product quality and sustainability. Cembrit Slate Duopitch continuously ventilated ridge tiles are specifically designed to provide a high level of ridgeline ventilation. Colour matched for use with Cembrit fibre cement slates, the ridge is suitable for pitched roofs ranging from 20° to 40°. The range includes start and end caps for a neat finish. Weighing 4kg, the product is lightweight, making it easy to transport and carry up to roof level. At 530mm in length, it is possible to carry two linear metres of ridge at a time. Cembrit Slate Duopitch Ridge Ventilation is a fibre cement product that complements the smooth, flush look of the fibre cement slates. The ridges are lighter in weight than concrete alternatives, making them easier to install for a roofer working at height. The ridges do not require electric power for cutting, or any dust suppression equipment, equalling a much easier and quicker fitting process. They can be dry fixed with readily available colour matched Torx countersunk screws and installation is not dependent on getting the correct mortar mix, or having to wait for dry weather.